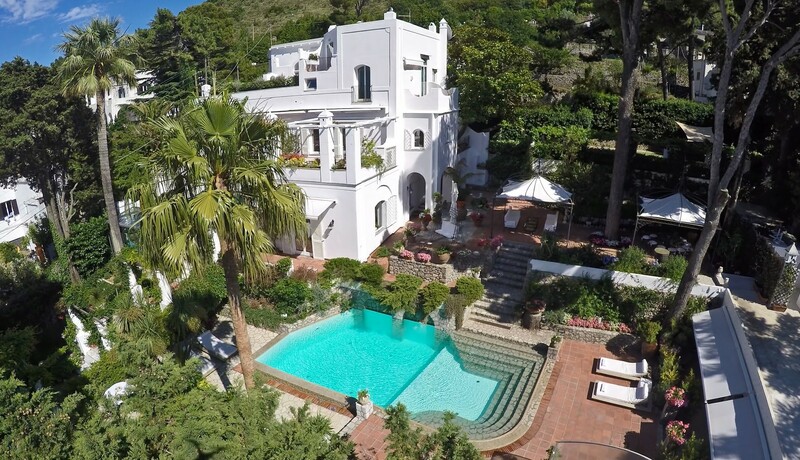 Villa Aurora, a historical Caprian country residence in a Neapolitan style dating back to the early 17th Century, is one of the few island villas still intact from that era. 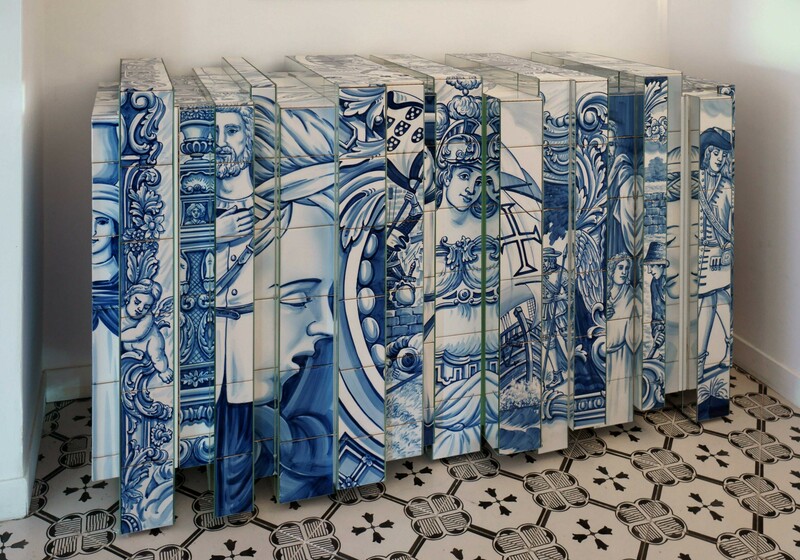 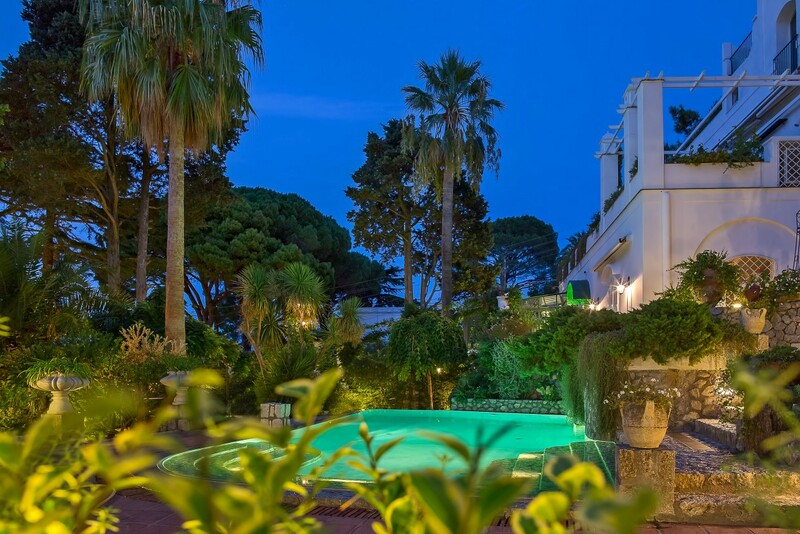 The present owner has painstakingly restored the villa and, due to the workmanship and superb interior decoration inspired by its themes of art, this historical residence retains all of its initial charm. 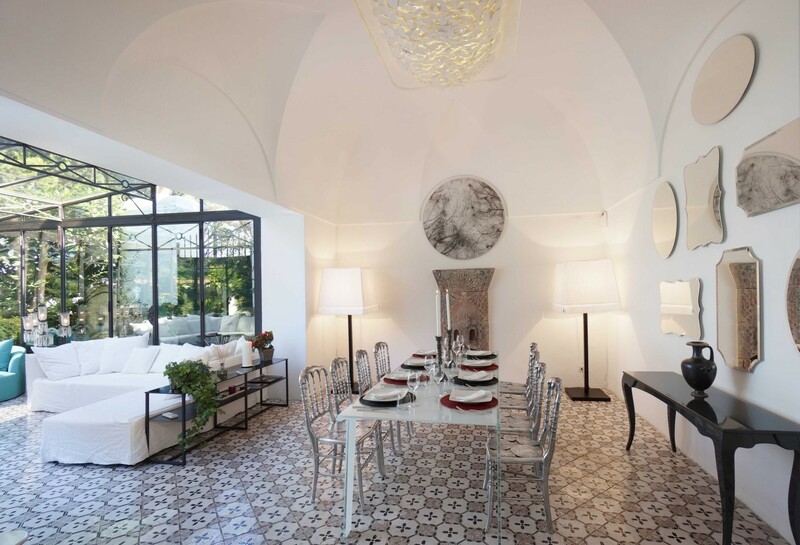 Thanks to the careful restoration carried out by the owner, the villa, while being transformed into an exclusive historical residence, has maintained its historical and architectural features. 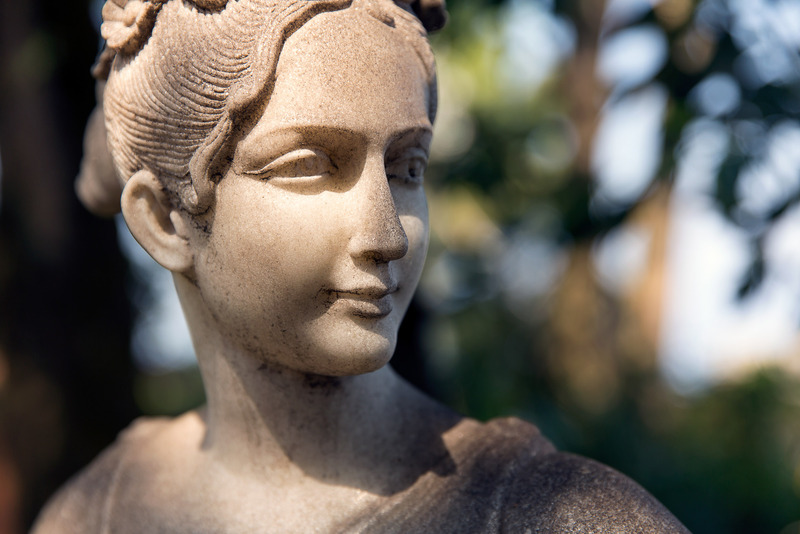 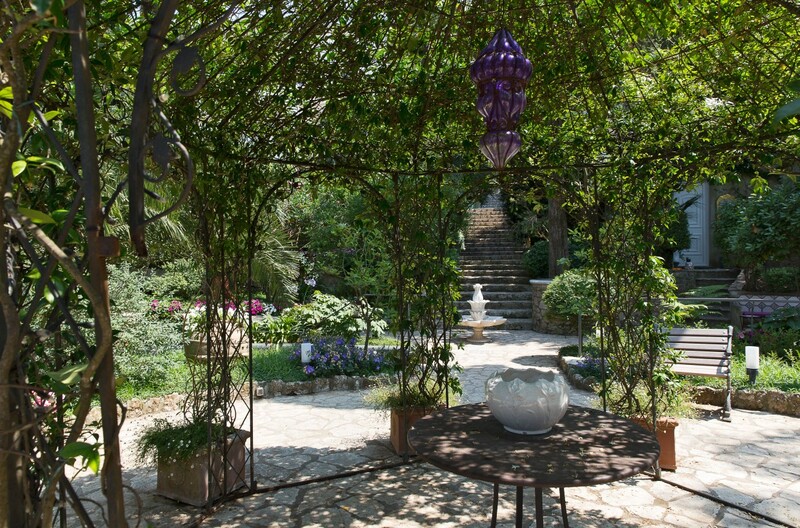 Behind the villa’s green gate, one finds an enchanting world so idyllic peace that takes one into is paradise. 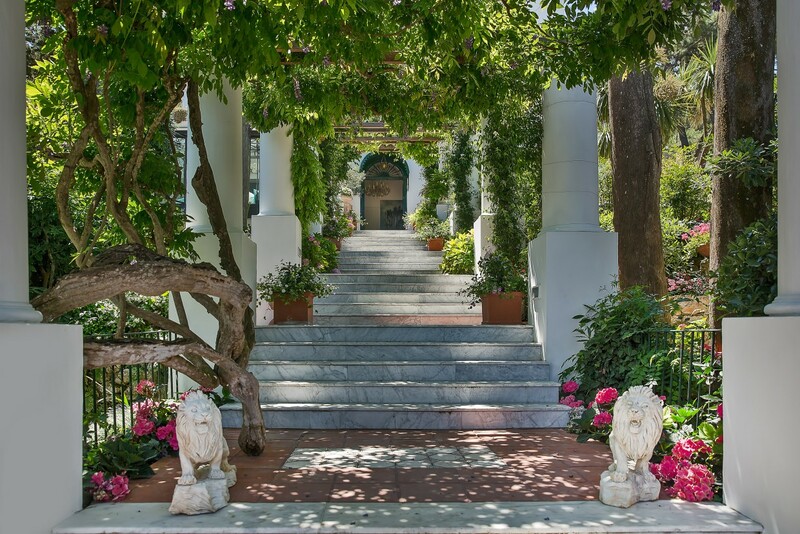 Steps ornamented by columns lead through the garden up to the main entrance. 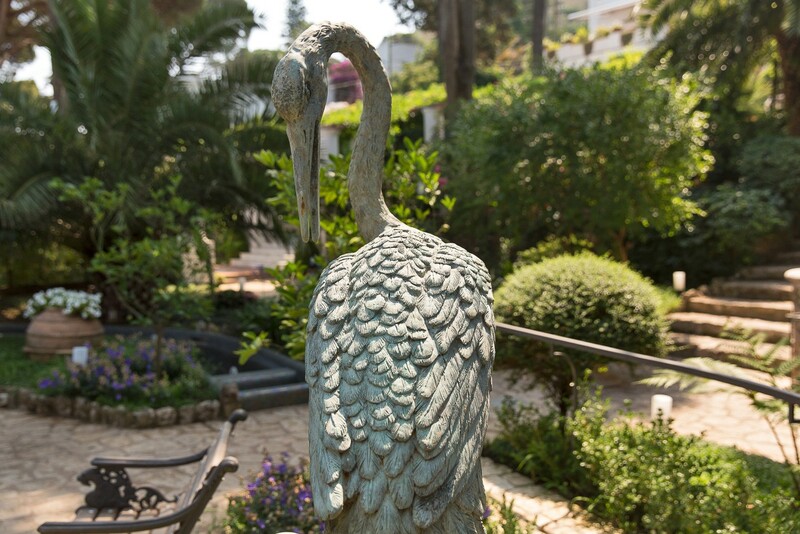 In this glorious setting, with its century old trees, marvellous displays of flowers, and a peacock-blue pool hidden amongst the flora, one remains amazed by the hospitality at hand. 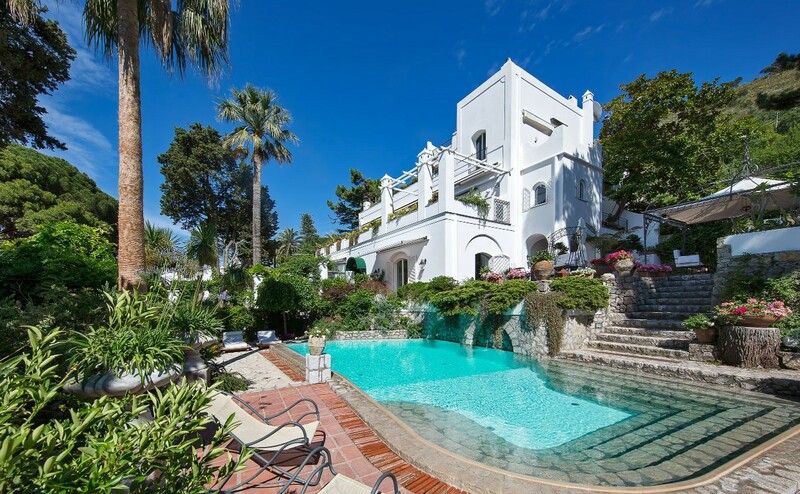 The island of Capri, symbolized the world over as the ideal haven for artists, key figures of European culture, and the traveling elite, still offers the unique atmosphere that enraptured its initial famous visitor’s years ago. 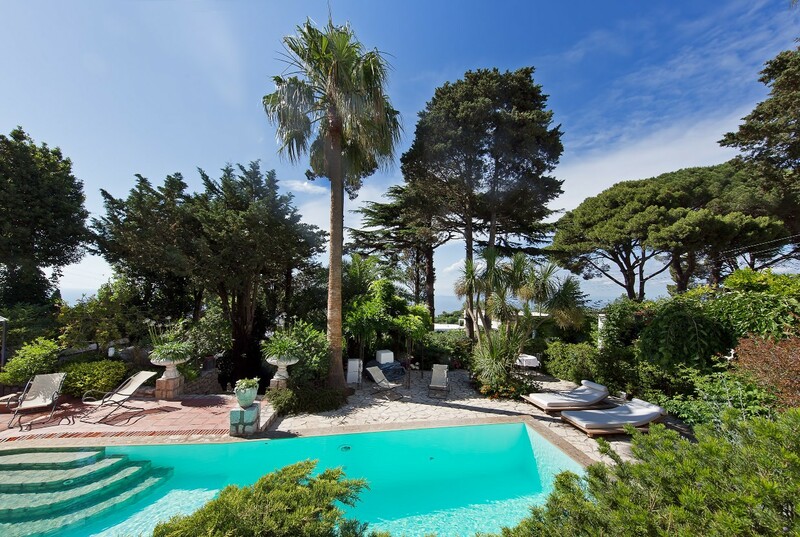 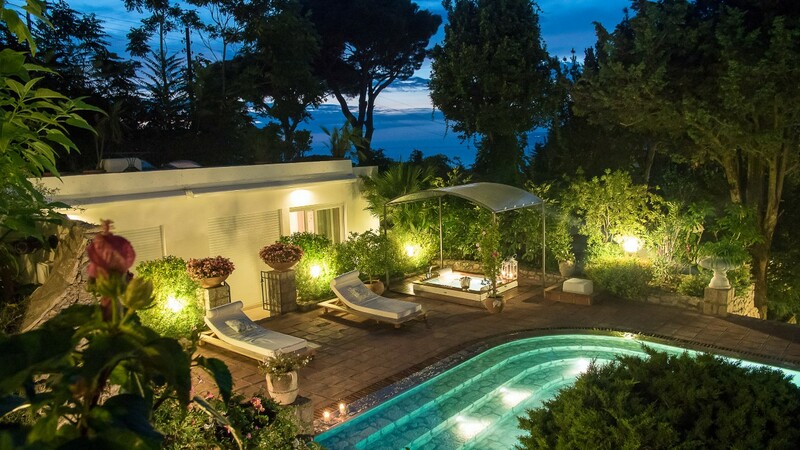 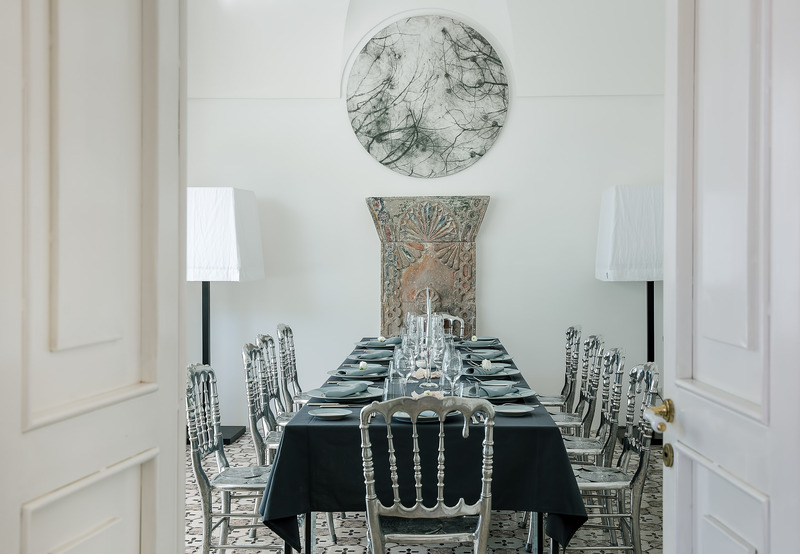 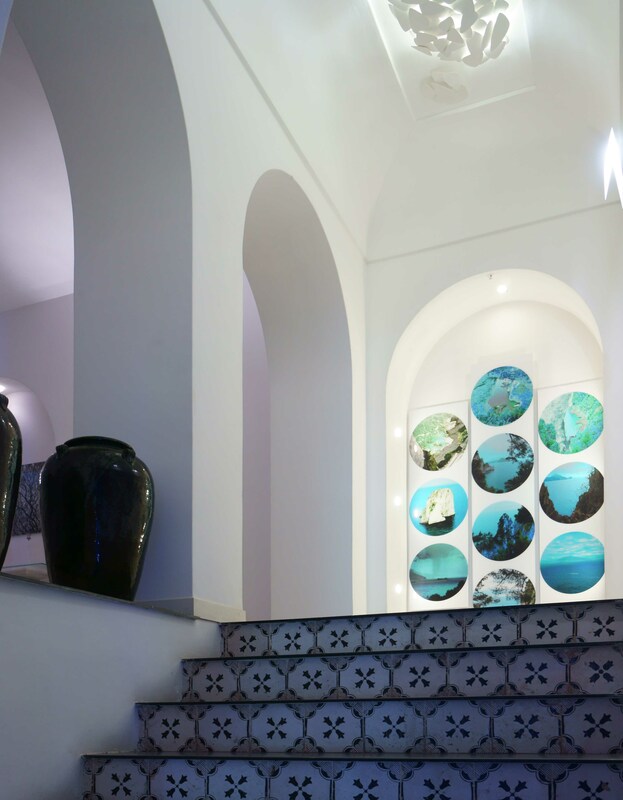 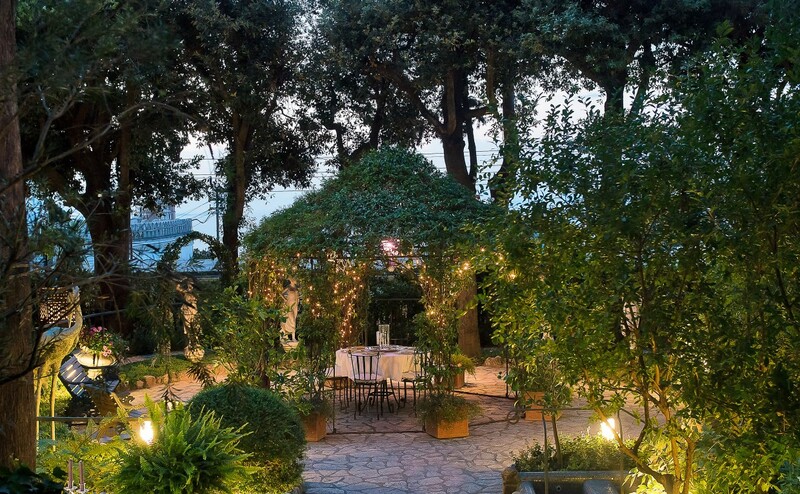 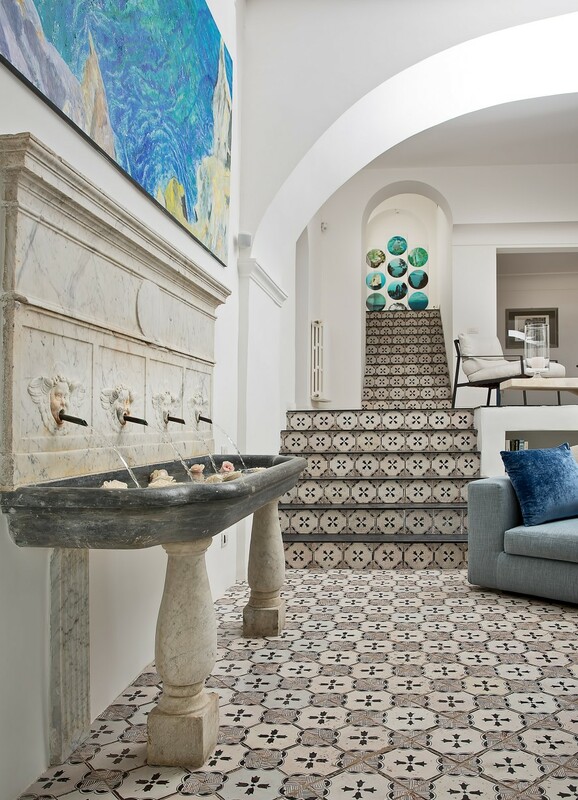 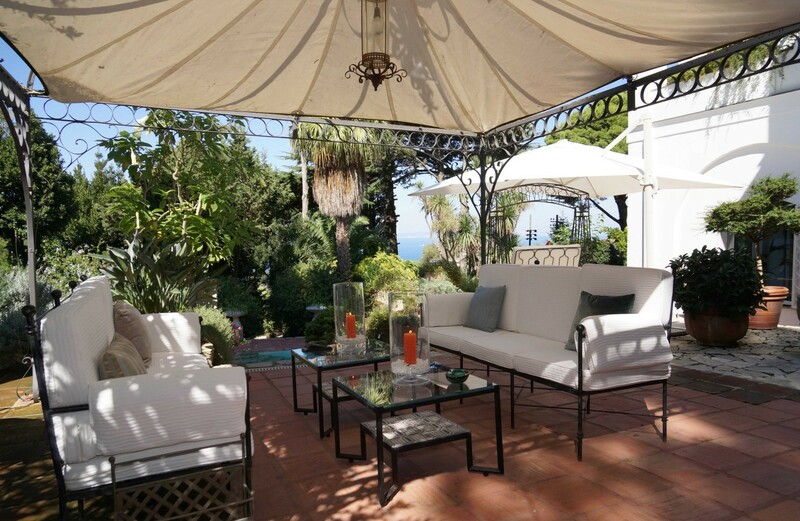 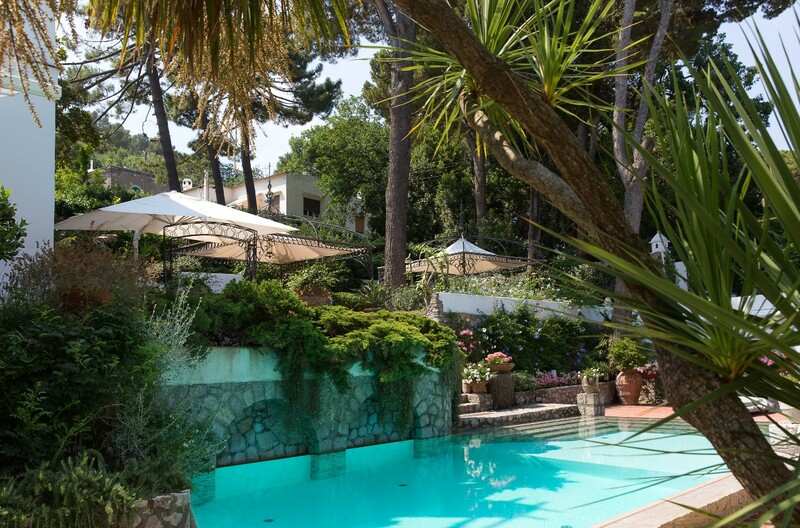 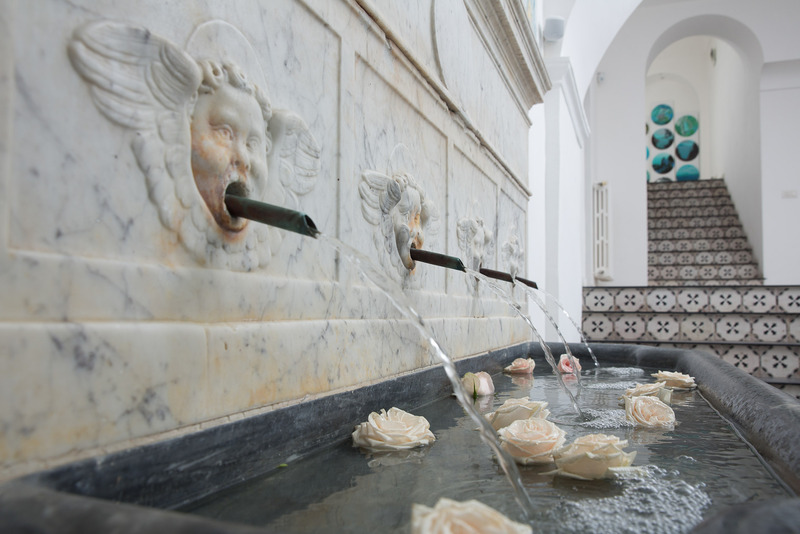 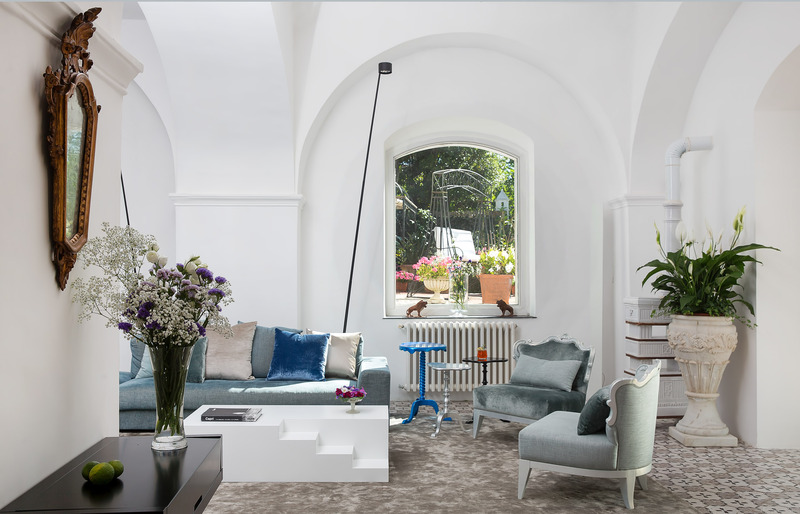 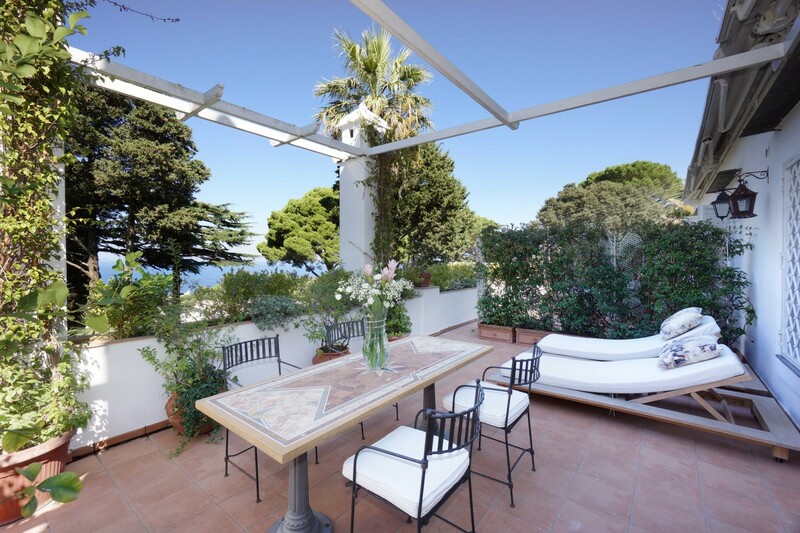 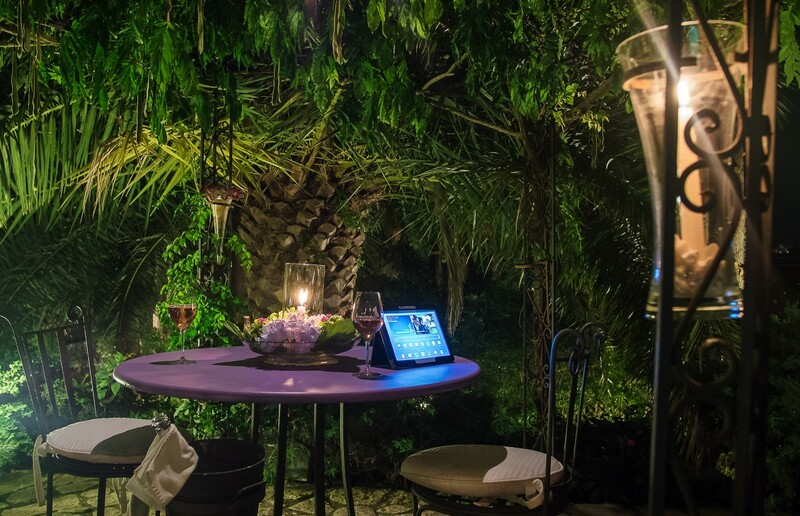 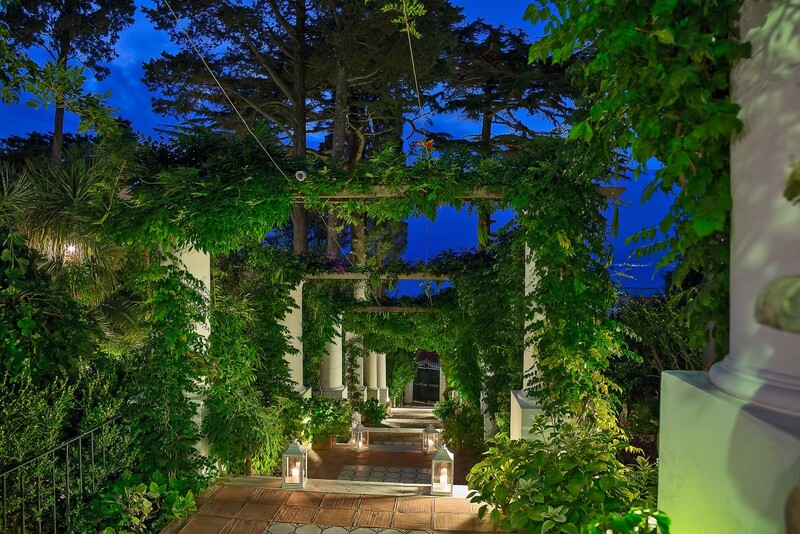 Villa Aurora, situated in the centre of Anacapri, offers its guest the maximum in hospitality, representing the perfect synthesis between the islands past and present. 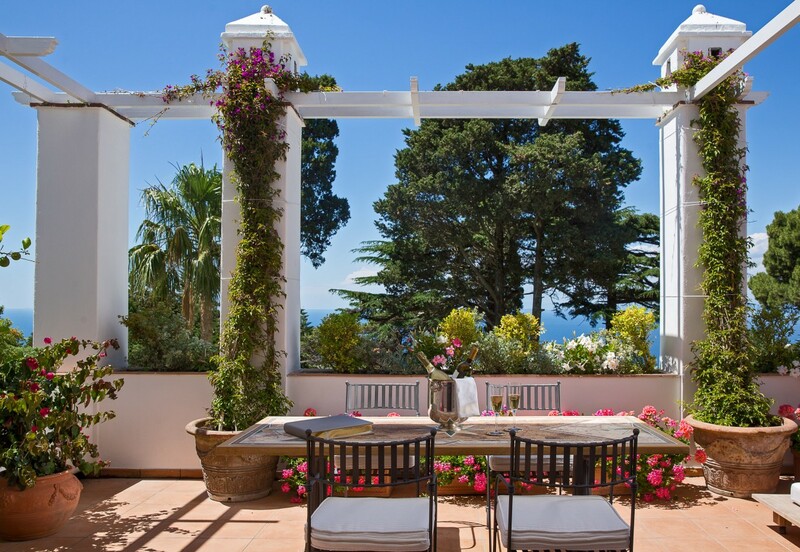 Choosing Capri for a holiday means allowing oneself to be seduced by its astounding natural beauty, unexpected tranquillity, vibrant colours, and intoxicating scents. 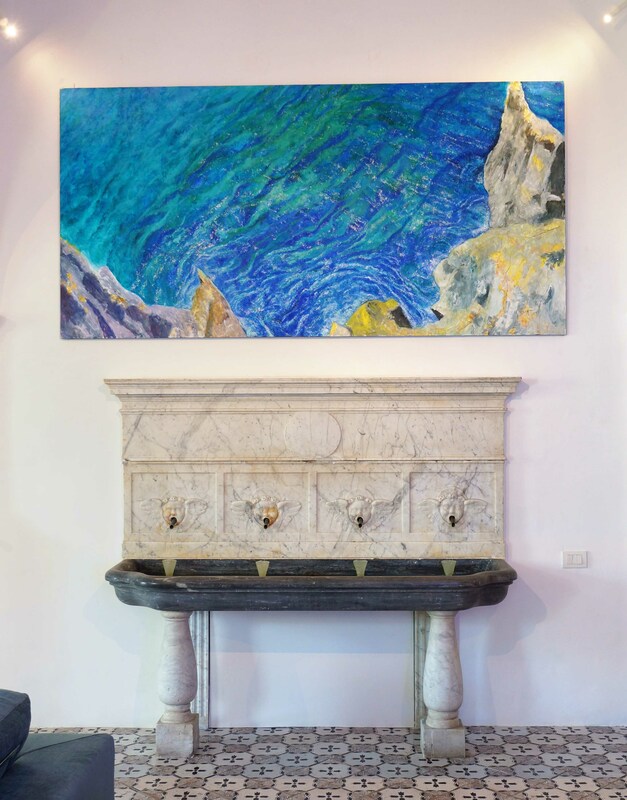 Capri offers visitors numerous opportunities to explore sites of historical interest and to behold the natural beauty of the island. 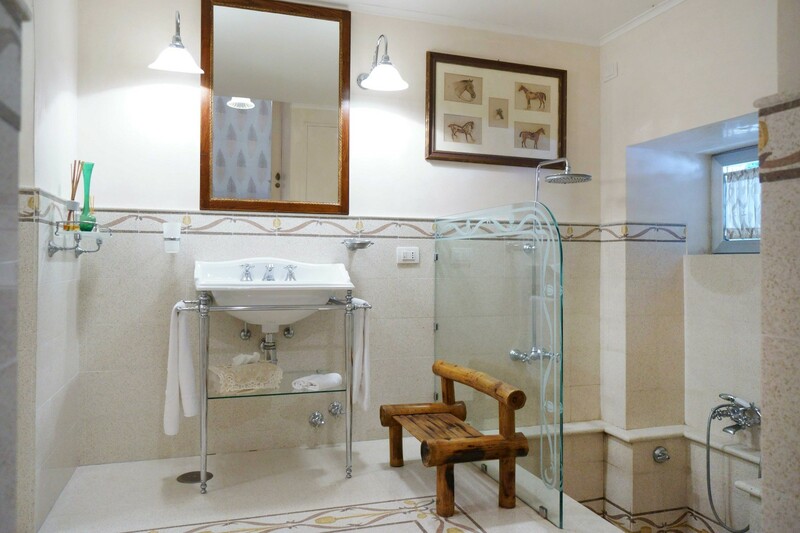 Room Facilities: Turkish bath/plunge pool/duplex shower or Jacuzzi. 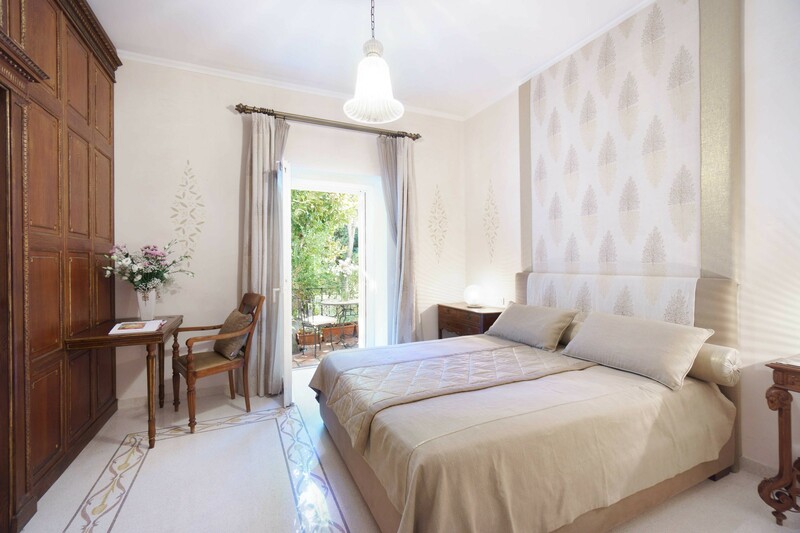 Air conditioning throughout, LCD satellite television, safety deposit box, mini bar, and Internet access. 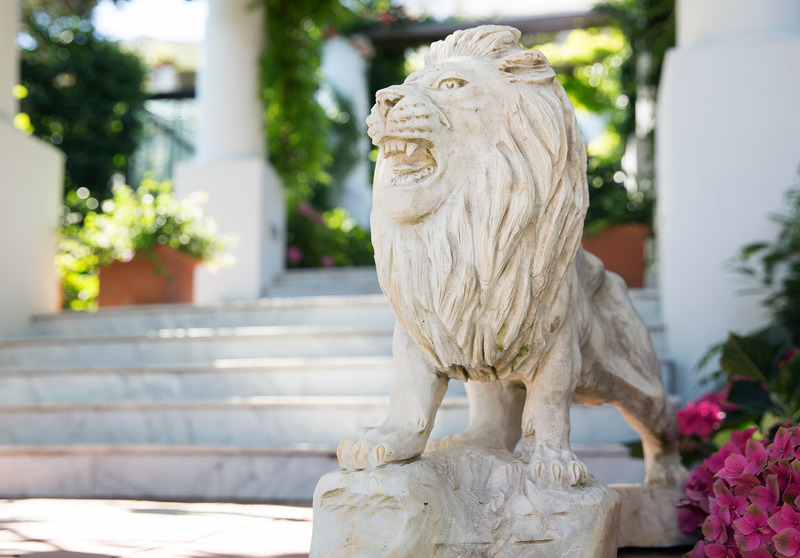 Only authorized staff and personnel are permitted to be onsite. 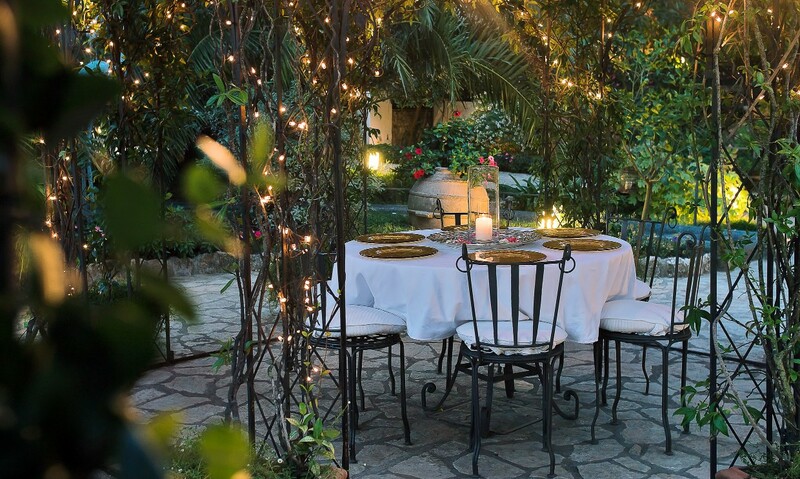 This includes but is not limited to chefs, cooks, housekeepers etc. 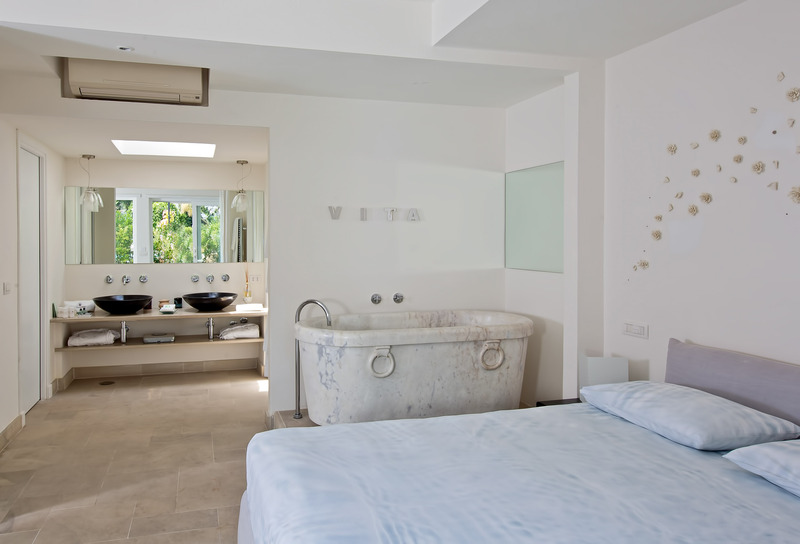 Talk to you Villa Specialist today for more details. 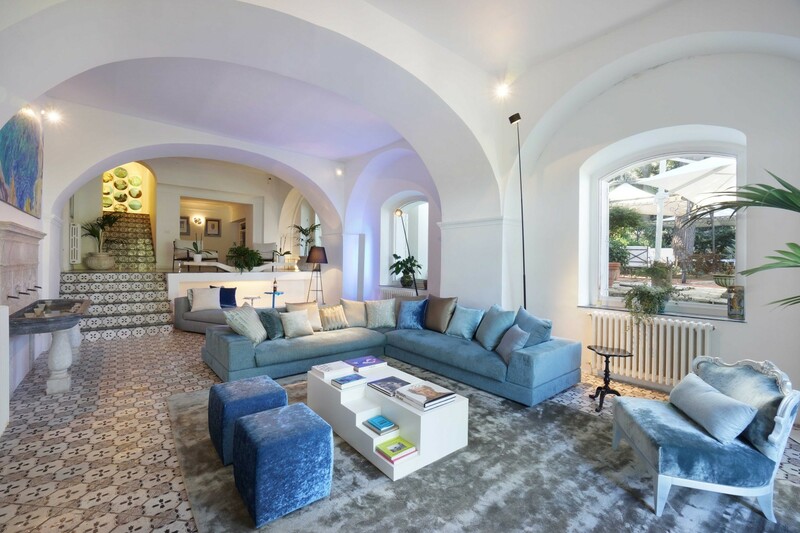 The overwhelming lounge is adorned by arch shaped ceilings, paintings, chromatic lighting, larges sofas in blue velvet, and coffee tables. 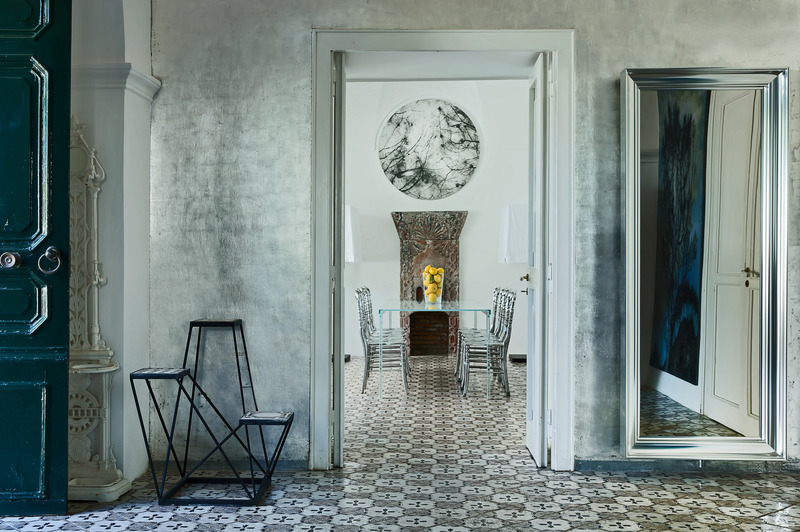 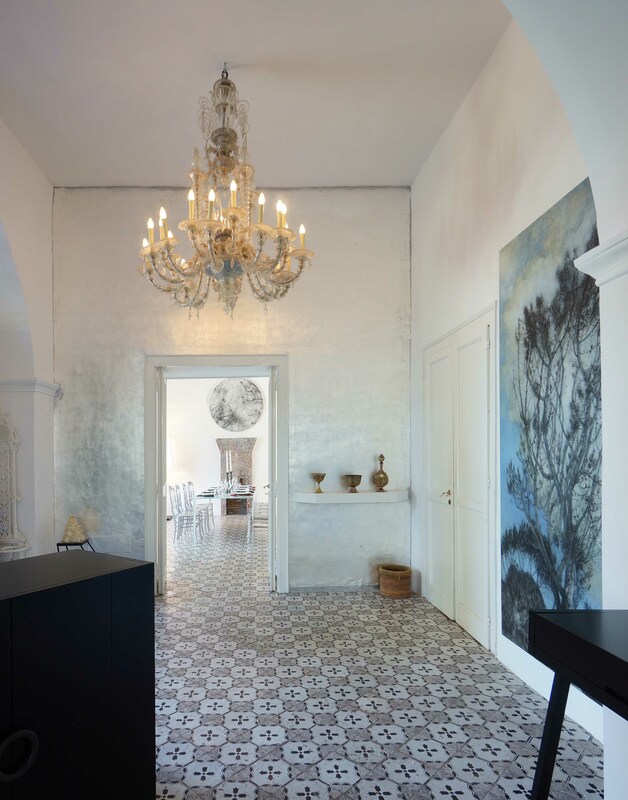 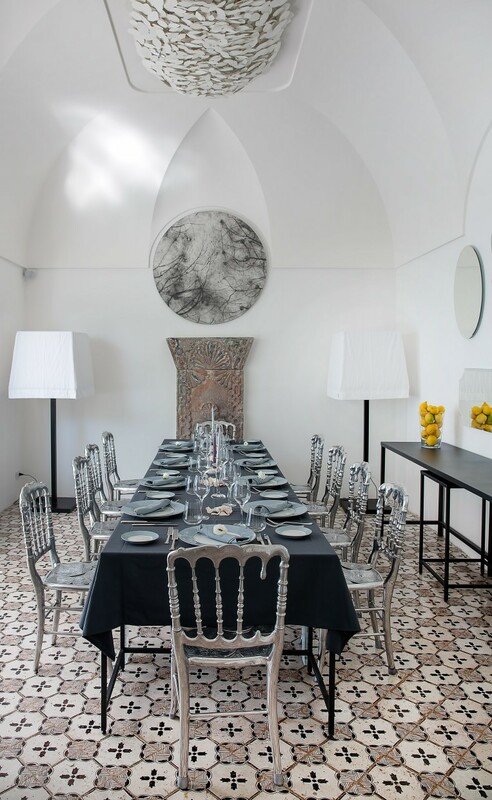 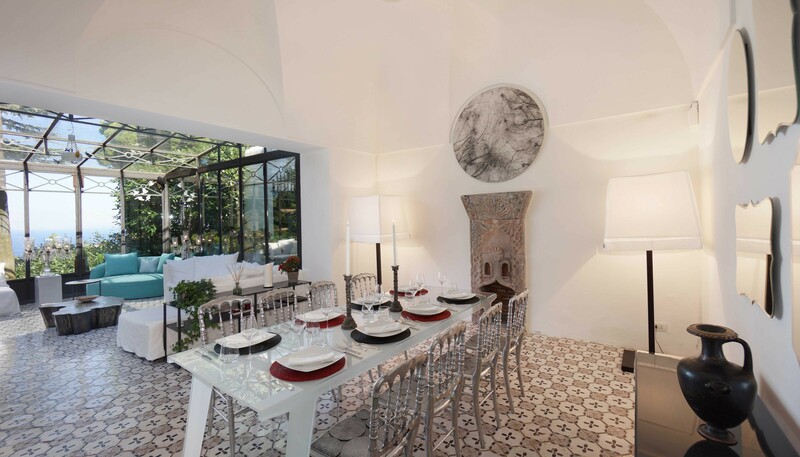 The beautiful floor with ancient hand painted tiles spreads through the villa from the living area to the dining room to the winter garden: the dining room boasts a glass-topped table and 10 chairs and interfaces with the kitchen, which is accessible only to the staff. 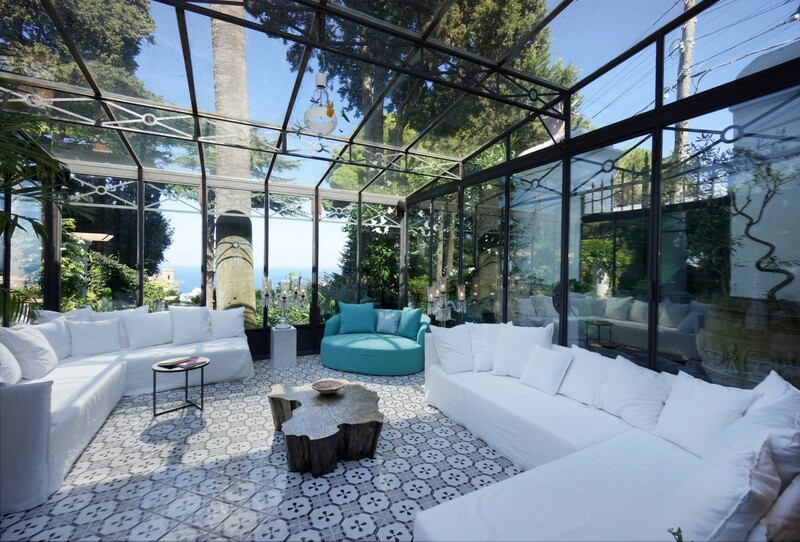 The winter garden offers glass walls opening into the garden, allowing its greenery and natural light to spread inside the home, while its numerous white sofas lend for comfortable seating on a cool evening. 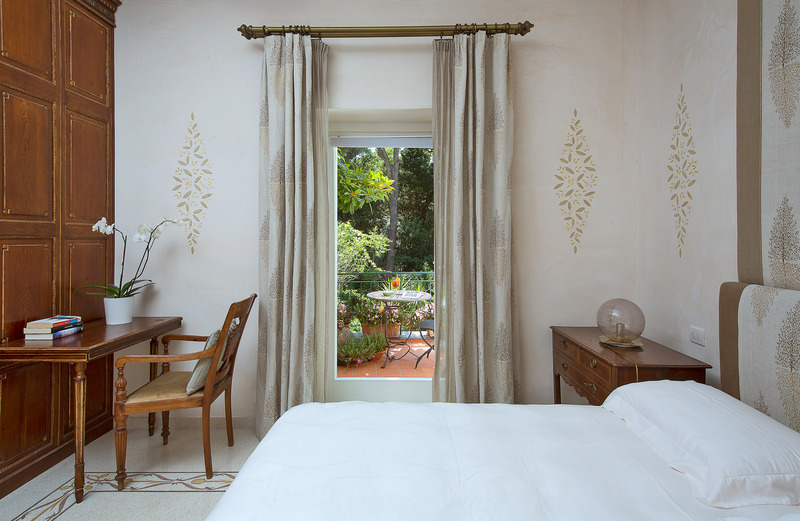 The villa offers seven unique and elegant bedrooms including a two-bedroom, two-bathroom garden suite, all meticulously restored and furnished, immersed in the exquisitely scented and marvellously colourful “literary garden”, equipped with every modern comfort. 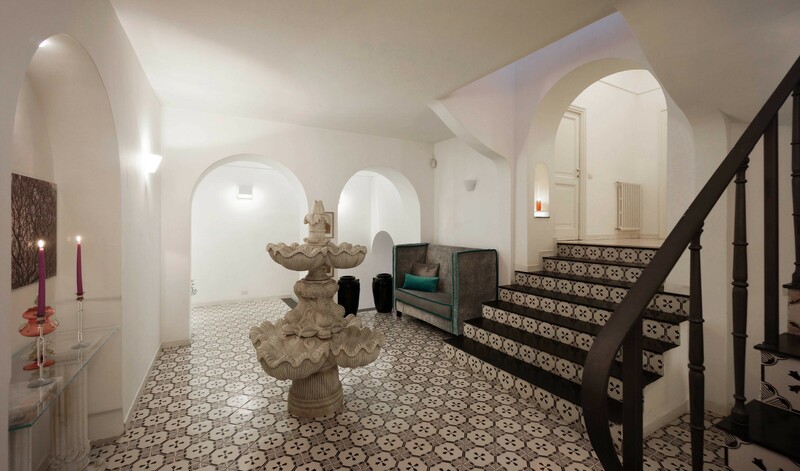 The rooms are accessible from the ground floor by a flight of 23 steps. 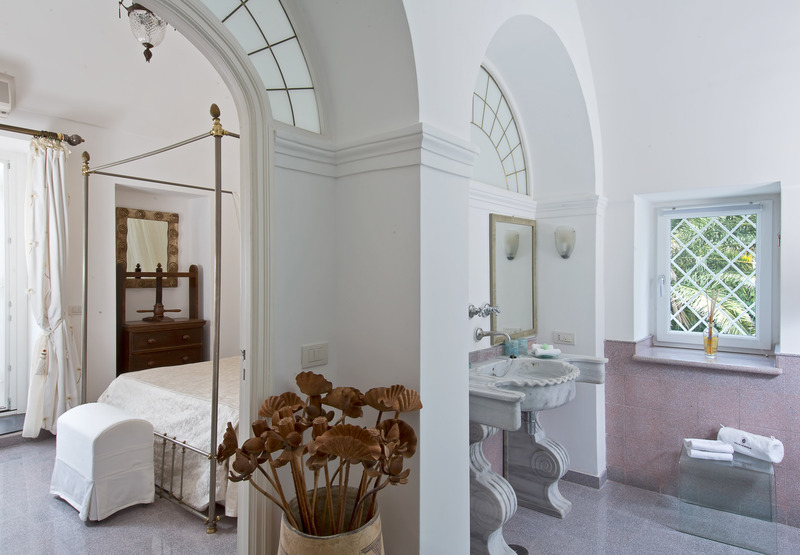 The bedrooms have been beautifully furnished in a way that perfectly complement the style of the renovated building. 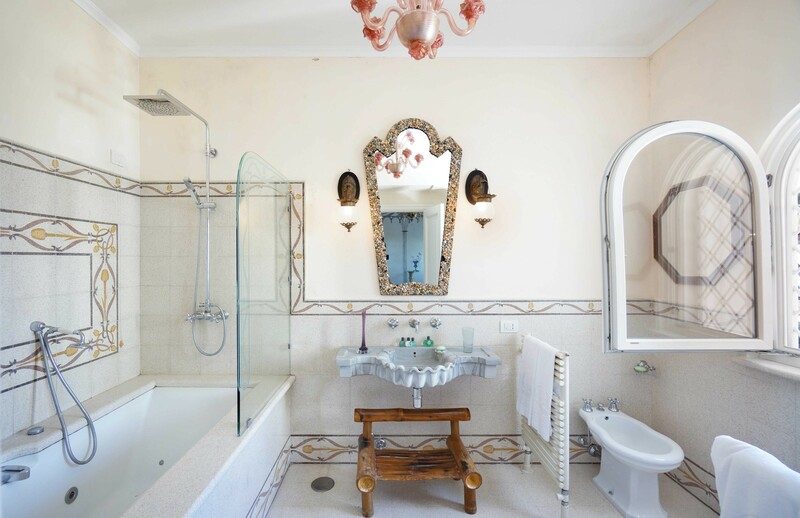 Guests can find sheer relaxation in their spacious bathrooms, which boast, according to the theme of their room, a Turkish bath, plunge pool, duplex shower, or Jacuzzi. 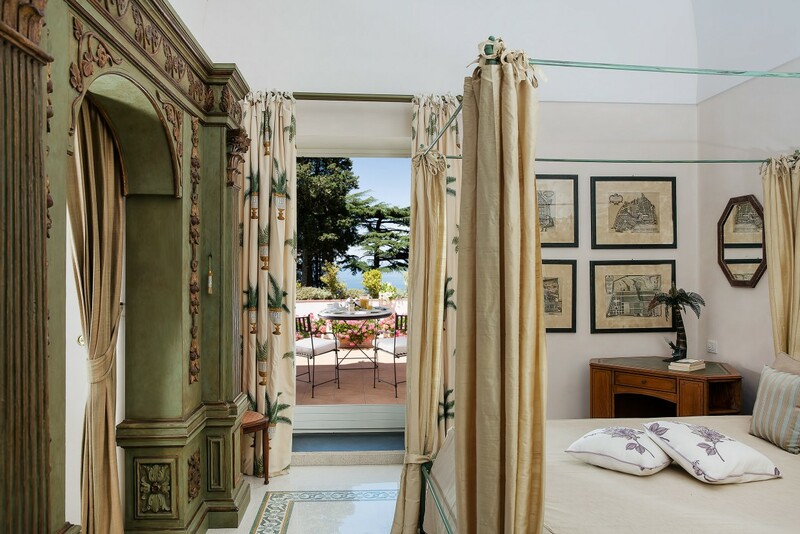 Most bedrooms have glorious, flower-covered terraces with superb views of the sea or the gardens. 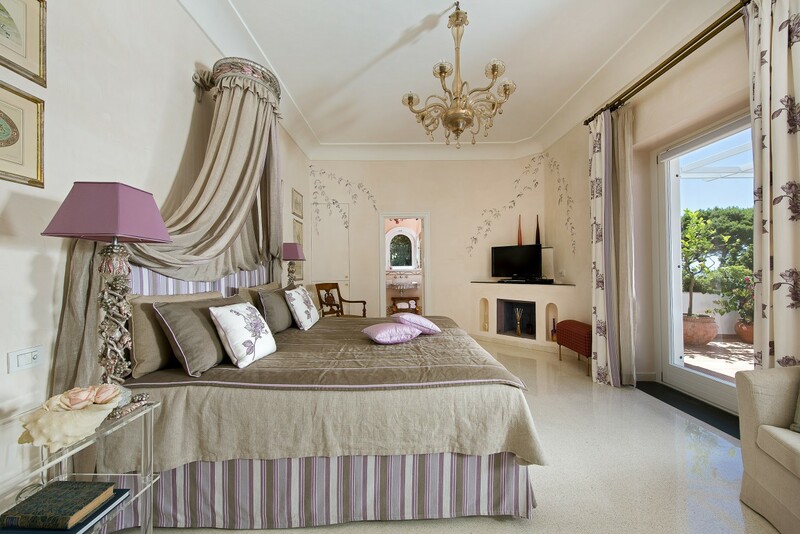 All rooms have air conditioning, LCD satellite television, DVD, safe deposit box, mini bar, and high-speed internet access. 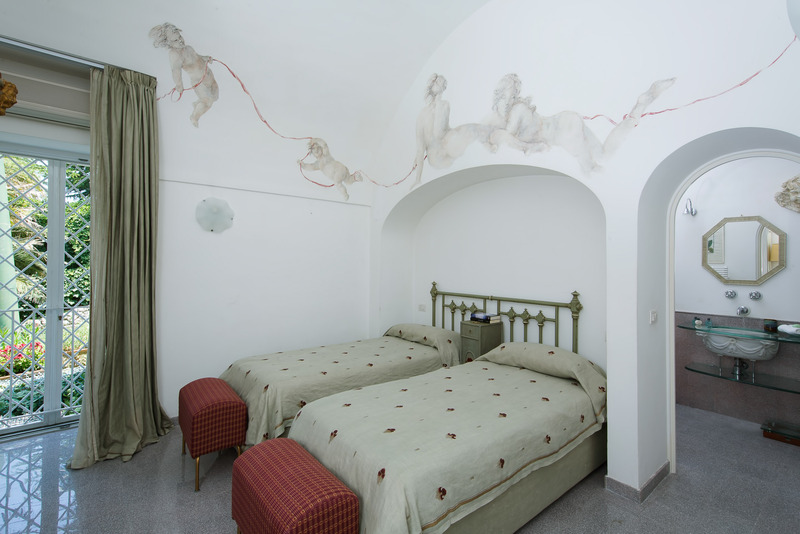 The Painter’s Room (Main villa): A delightful, frescoed bedroom, inspired by the era of the fabulous Marchigiana bookcase, work of a well-known artist. 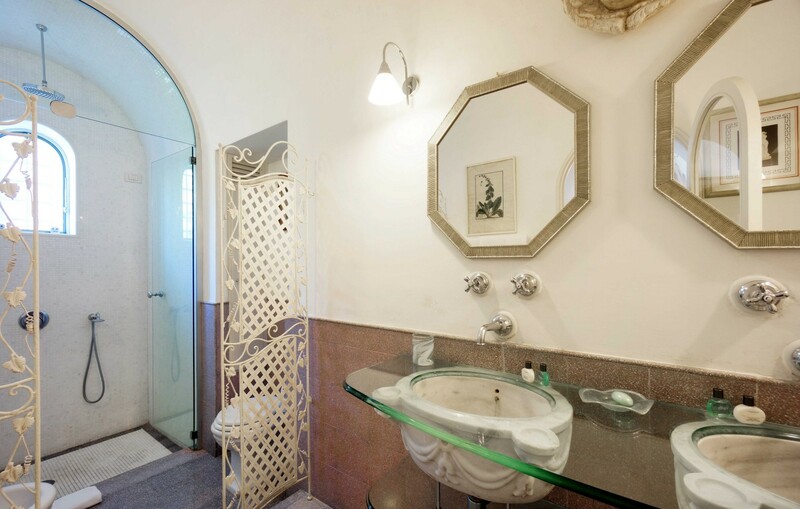 A splendid bathroom in white marble mosaic and two antique bathtubs dating back to the 18th century complete the furnishings. 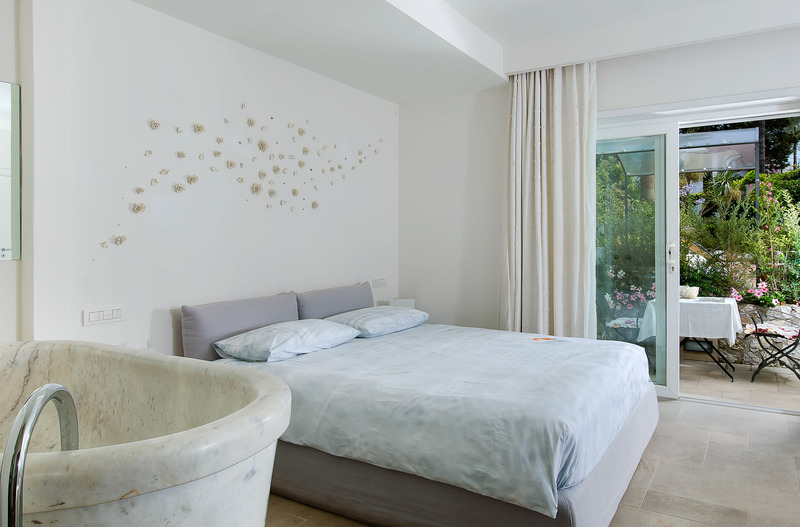 The artist’s room can be converted from twin beds to a single queen-size bed. 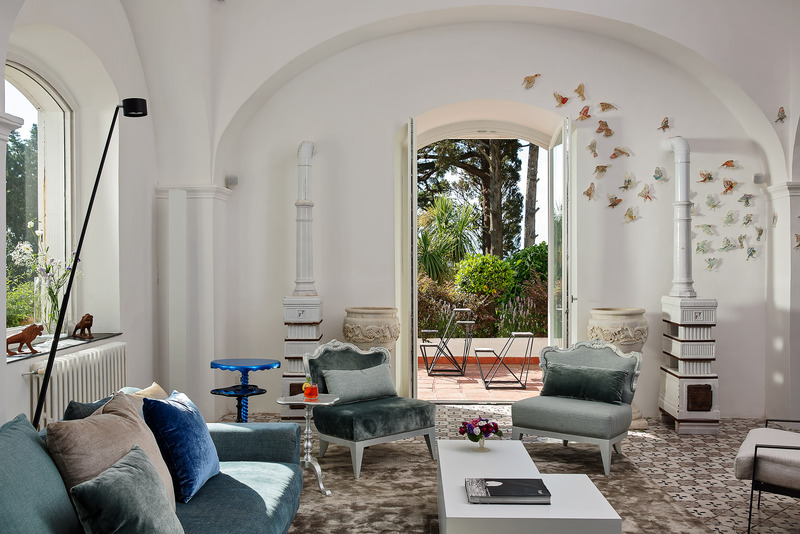 The Traveller’s room (Main villa): Rare artefacts and souvenirs brought back from voyages to the Orient create an exotic atmosphere in this splendid room. 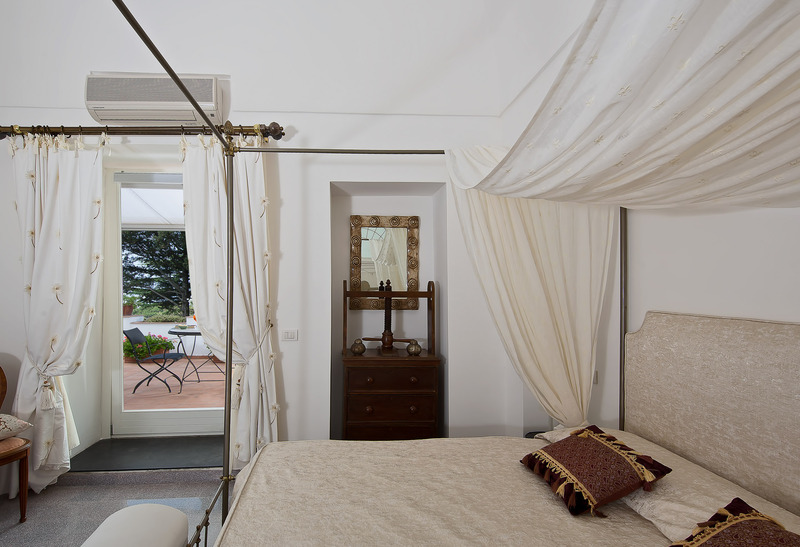 From the large four-poster bed, hung with beautiful light-coloured drapes, one can look out towards the spacious terrace with Sea view. 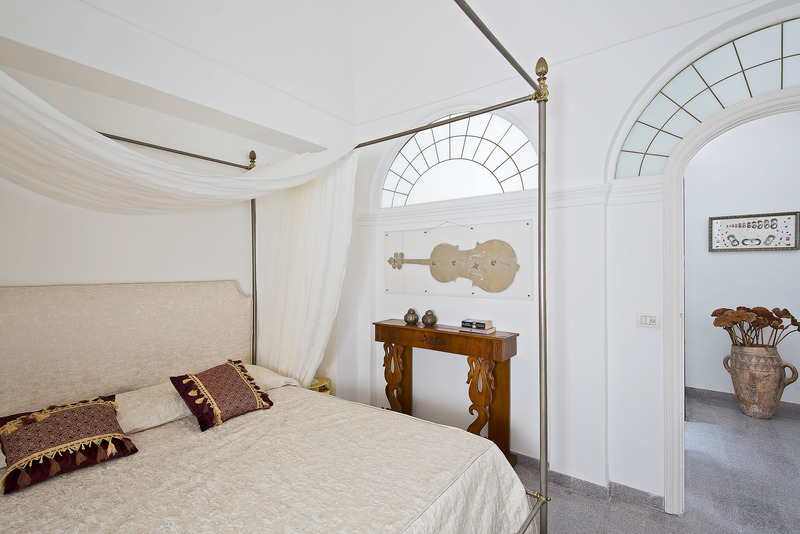 The Rialto room (Main villa): The highlight of this impressive room is the 18th century Venetian bookcase, placed at the entrance to the boudoir, and boasting a large Turkish steam room with shower. 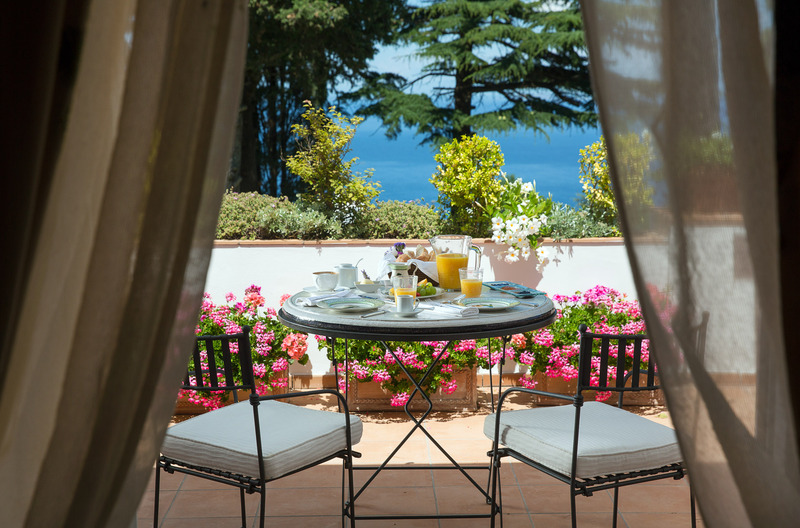 An exquisite marble table, just perfect for breakfast to be served upon, enhances the enchanting flower-decked terrace. 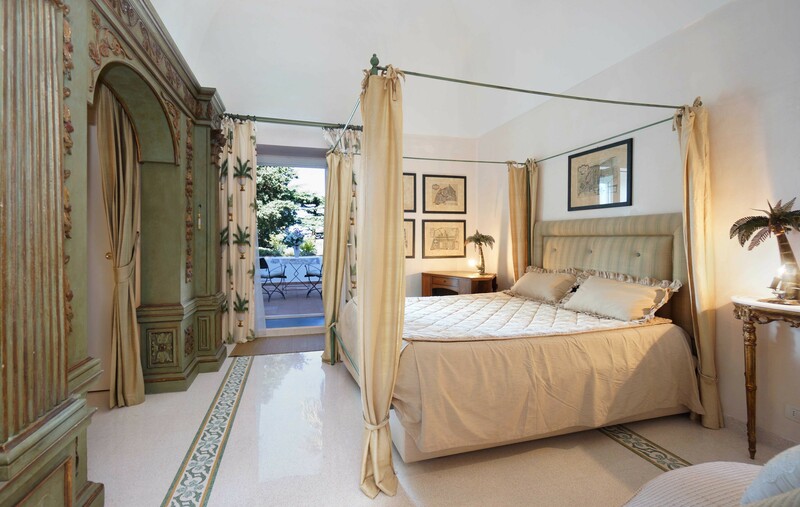 The Hunter’s room (Main villa): Once the master bedroom, this bedroom still houses a fabulous collection of Neapolitan school paintings from the 17th century, which form a splendid backdrop to its beautiful fabrics, which drape the two large beds. 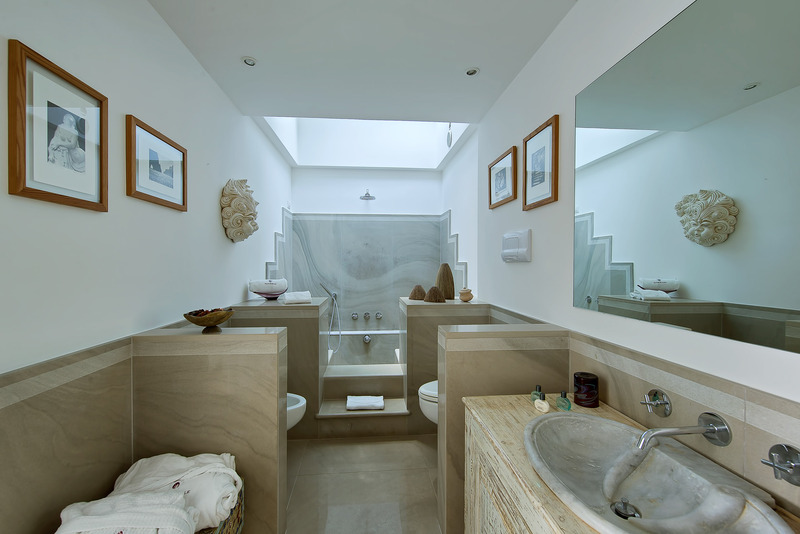 The spacious bathroom has a Jacuzzi and enjoys a sea view from the terrace. 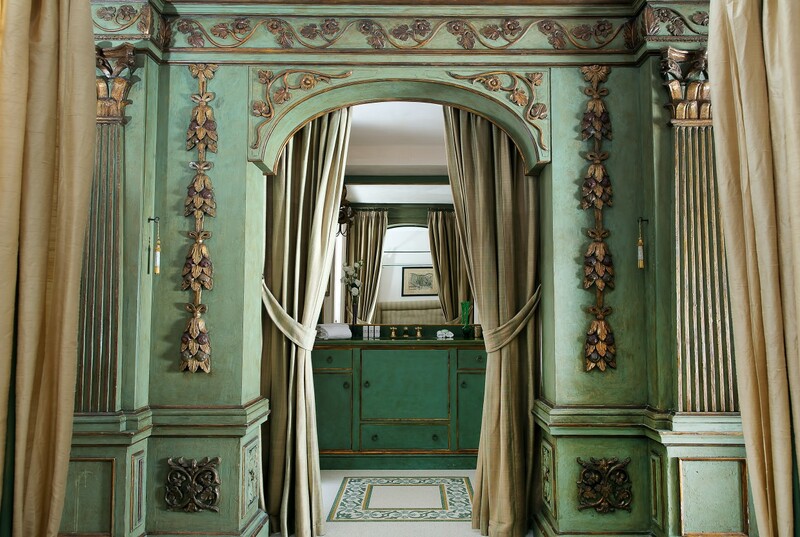 The French Room (Main villa): Exquisite boiserie panels from the 17th century adorn an entire wall and inspire the name of this sumptuous room with its large four-poster bed draped in beautiful light-coloured fabrics. 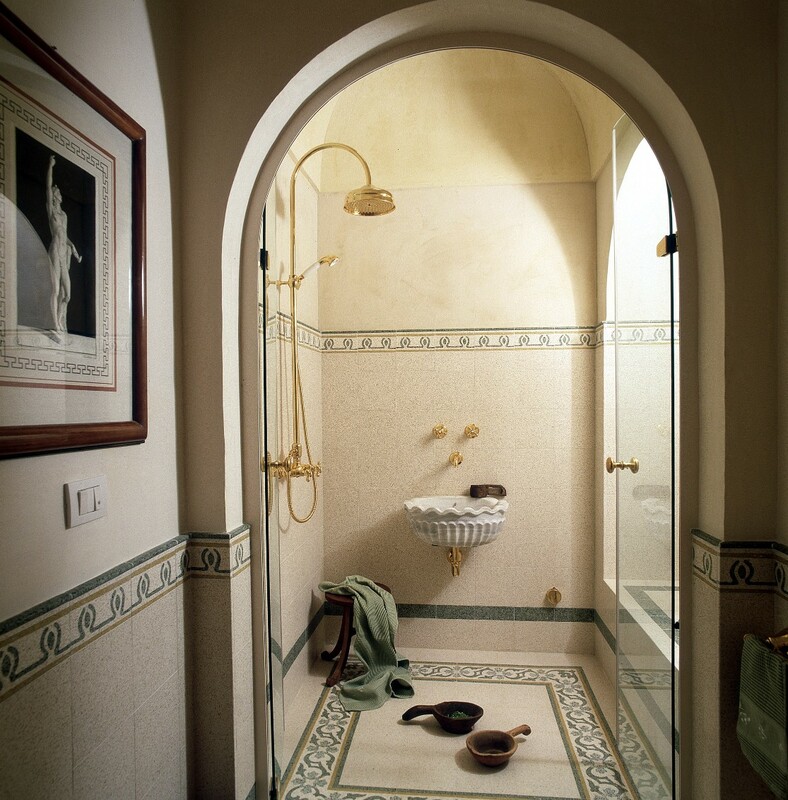 The bathroom, in Scagliola, boasts a plunge pool. 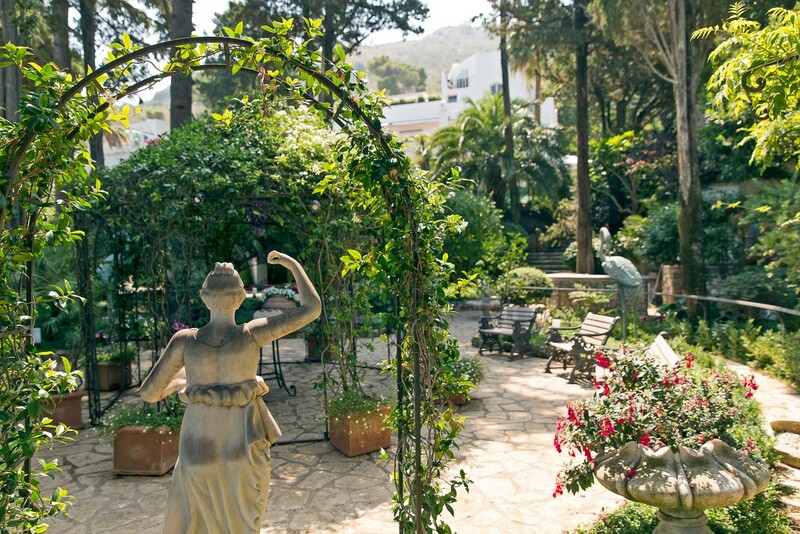 The charming terrace looks out over the delicately perfumed garden. 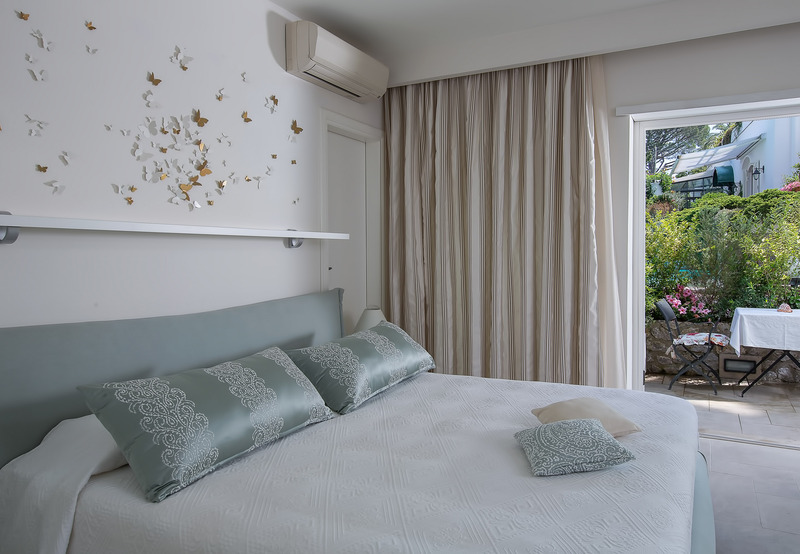 The Sea Room (Annex): Adjacent to the pool area, the newly renovated Sea Room comprises a large, airy and sunlit bedroom with modern furnishings: a queen-size bed, modular sitting area with plasma screen TV and surround sound. 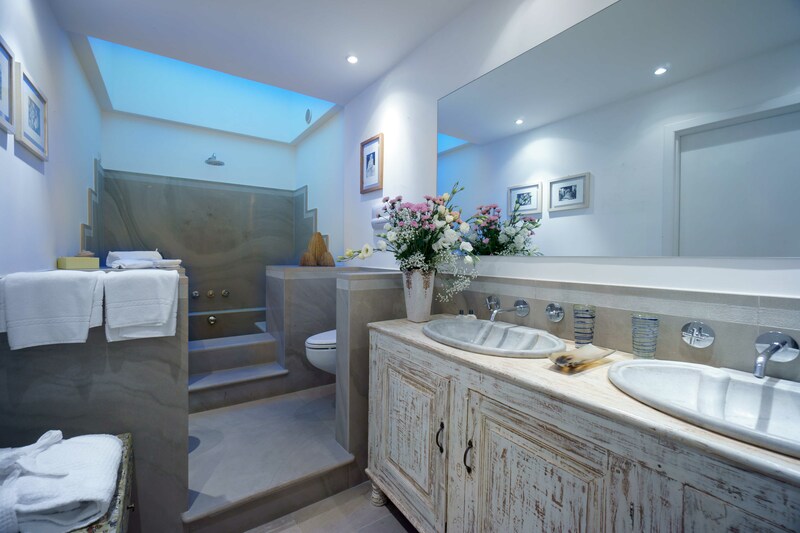 The luxurious bathroom features a sky-lit roman bath with shower. 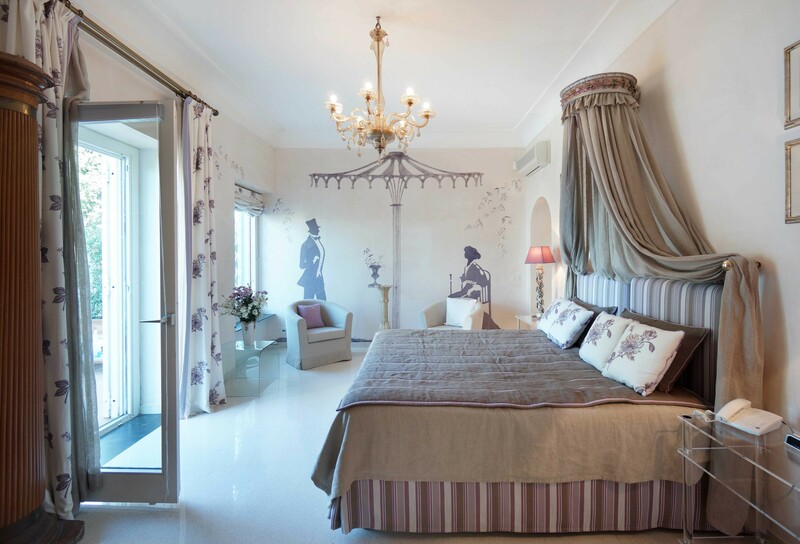 Queen-size bed can be converted into two twin beds. 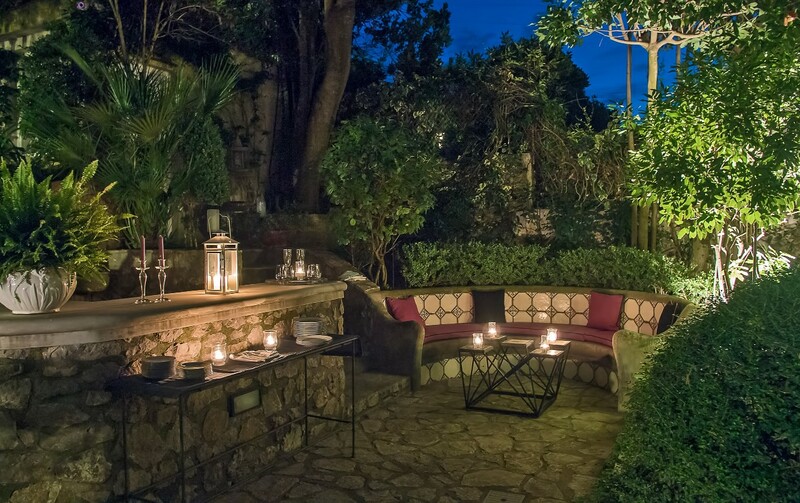 Small patio. 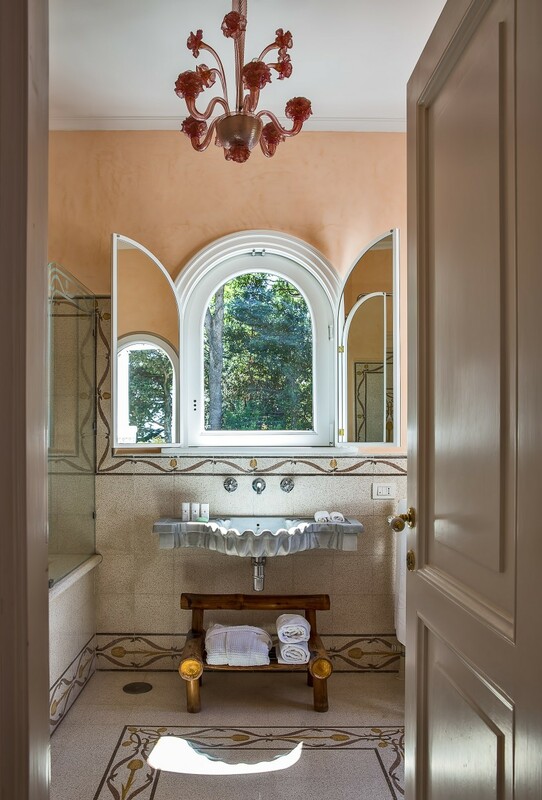 The Garden Room (Annex): Adjacent to the pool area, the newly renovated Garden Room features a large marble tub next to the queen-size platform bed of this sunlit room. 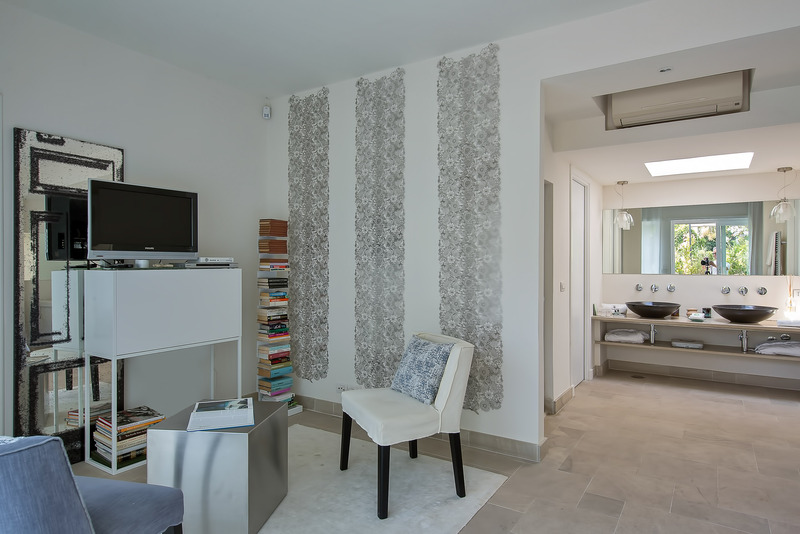 There is a large dressing area with enclosed stone shower and walk-in closet. 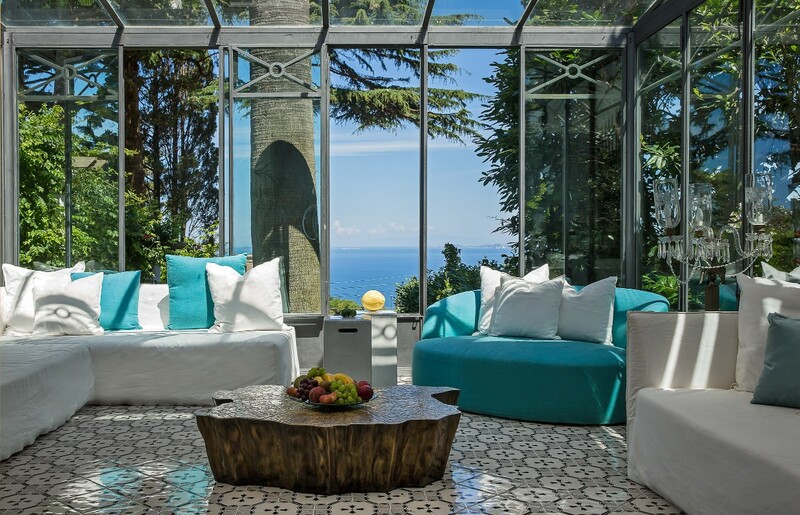 Beyond the Garden Room’s Art Deco sitting area there is a small patio with spiral staircase leading to a private sundeck with sea view. 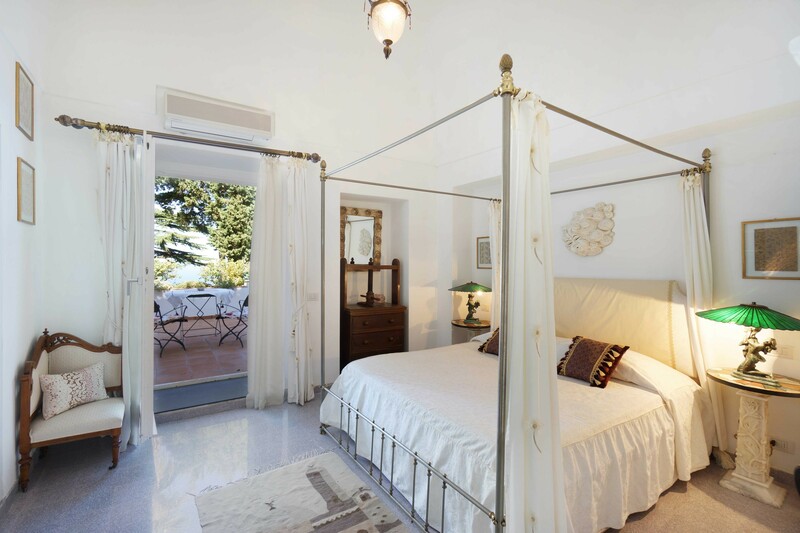 King-size bed. 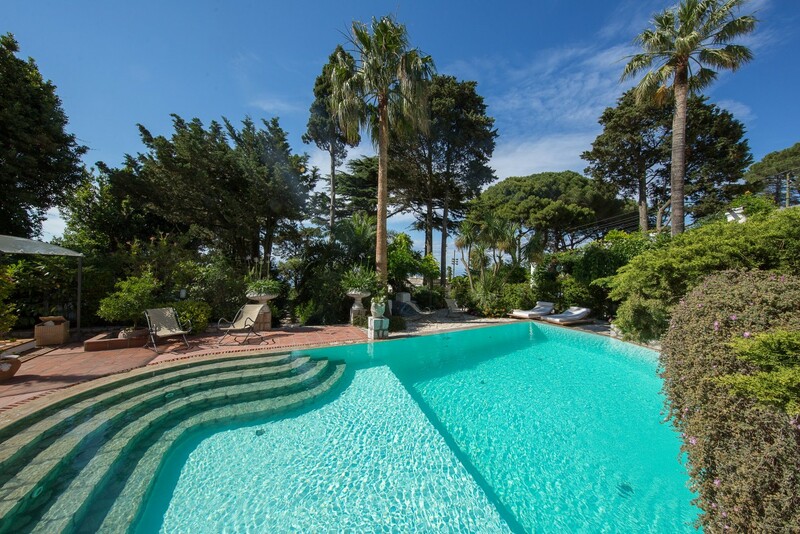 Villa Aurora’s elegant swimming pool (ca 60 sq. 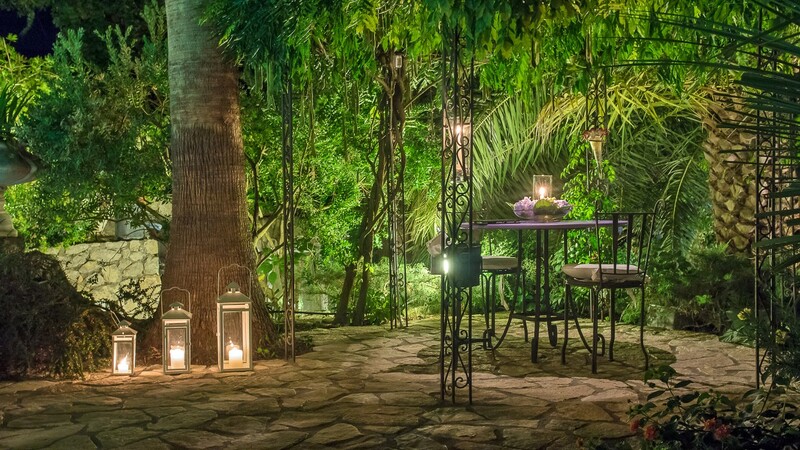 meters) is immersed in its lush garden. 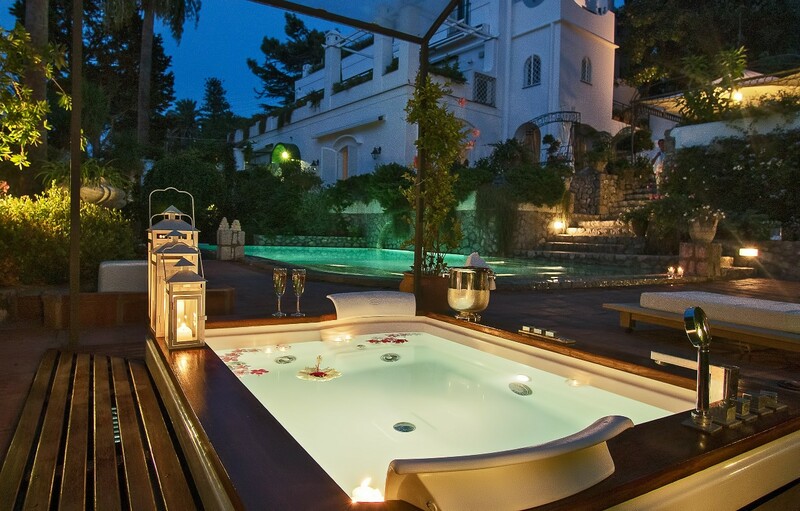 Besides the pool lies the outdoor Jacuzzi. 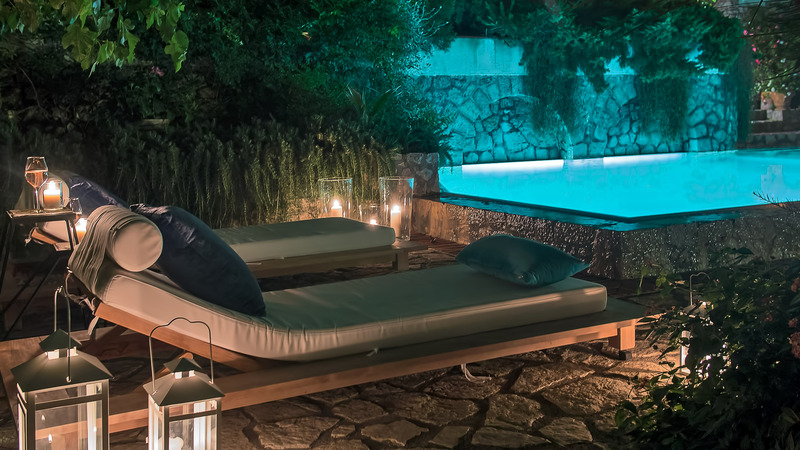 The contrasts of the green colour of the pool, the water, and the stones create a sublime harmony, diffusing calm and serenity, making the hours spent at the poolside moments of sheer relax. 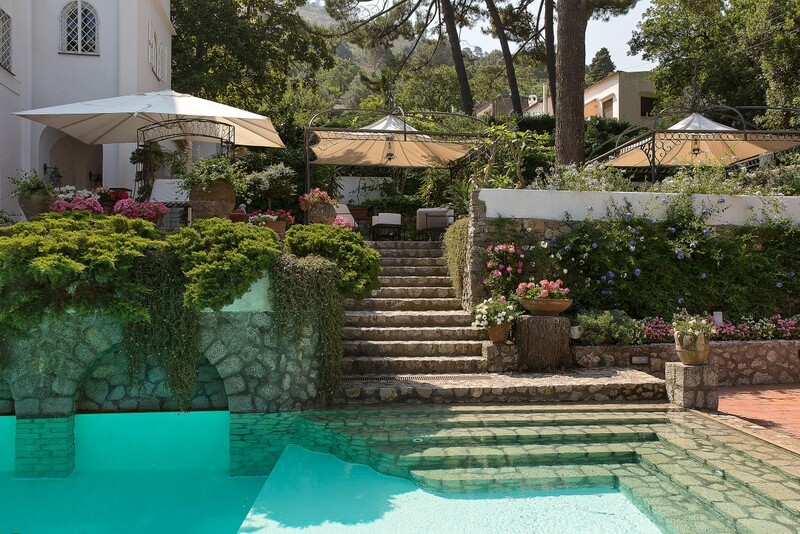 Guests will love a refreshing dip in the pool, a drink whilst soaking up the sunshine, or a delicious snack. 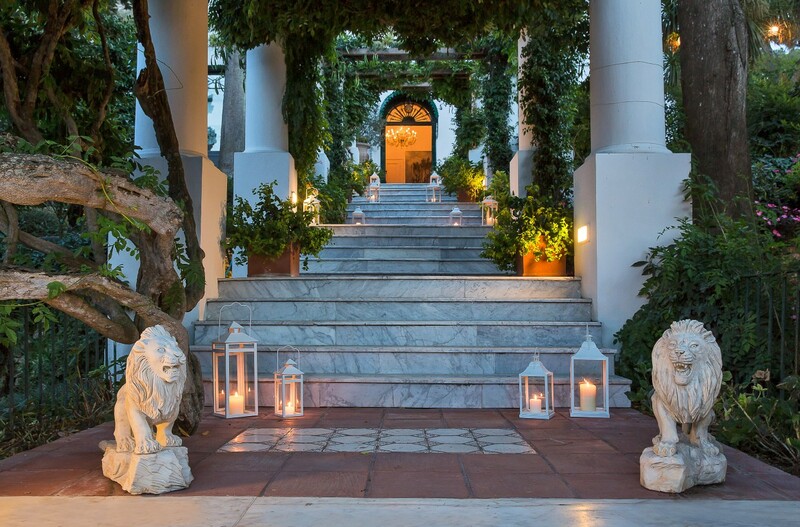 Descending the ancient flight of stone steps, one finds itself in the wonderful “Secret Garden” – the fruit of the loving attention of generations of women who have tended to it over the years. 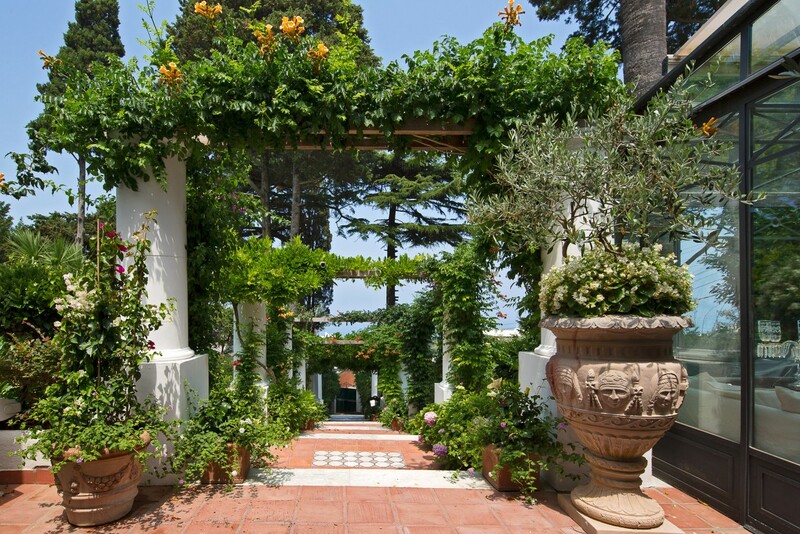 Bushes of Viburnum Mariesii, the Datura with their “Angel’s Trumpet” flowers, pomegranate trees, passion flowers, and arches of climbing roses create the perfect setting for a moment of reading, music, or quiet meditation. 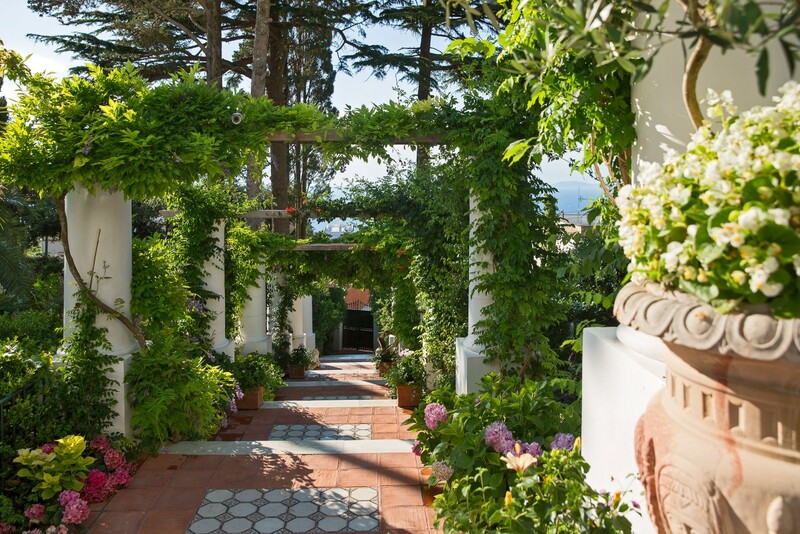 A 5-min walk from the main square in Anacapri, down a beautiful old footpath through near the center of town. 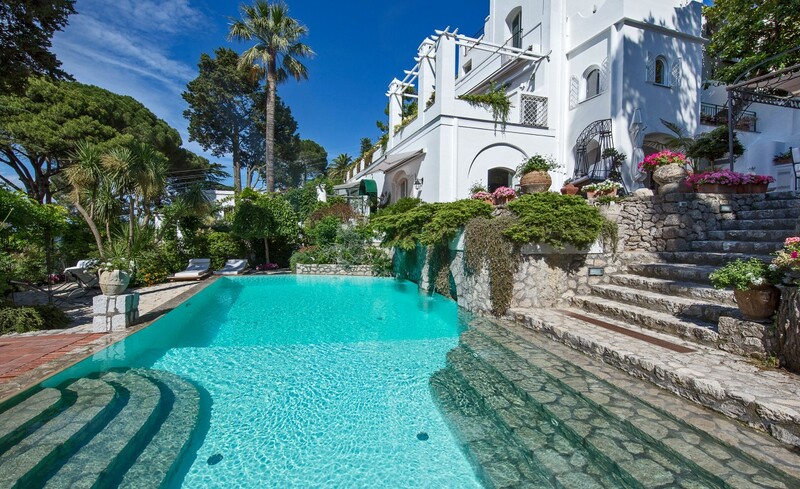 The villa is accessible only by foot. 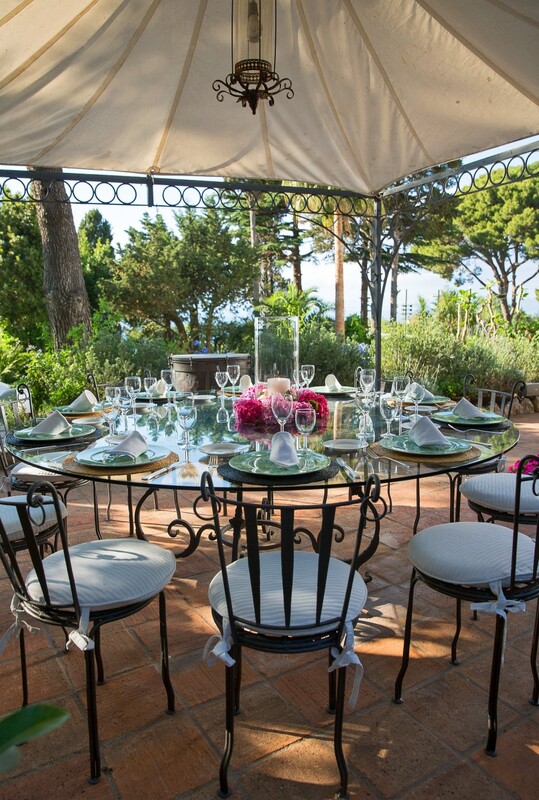 Cook, cook assistants and waiter for a maximum of 8 hours per day to prepare lunch or dinner. 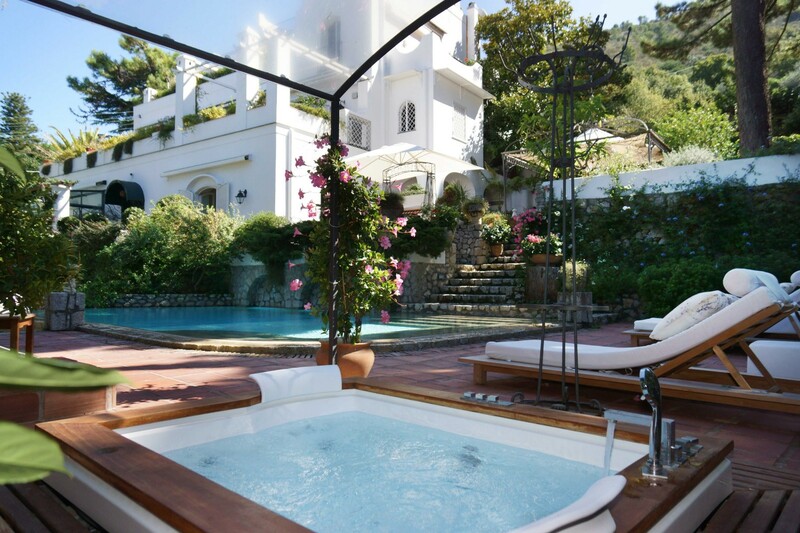 (Food & beverages for lunch and dinner are not included).